This 1986 Riveria 30 Flybridge is presented in superb condition following a full major refit. Single Volvo Penta AQAD40 165hp Diesel has less than 800 hours and duo props tuned and balanced ready to go. Twin helm a bonus in this compact boat. This is a ‘must inspect’ vessel. Appears that nothing needs to be done to the boat and will provide years of family enjoyment or the ‘getaway from it all’ boat. Exterior presents beautifully, repainted with Alexseal marine paints. Tasteful interior woodwork and trim is finished with varnished timber. New upholstery on the settee and the dinette, which converts to a double bed. Step to the well equipped galley that has come up looking like new, with new stove, hot / cold pressure water and new clean tidy benches with heaps of storage. Light and airy saloon and galley and big V berth forward with head and shower. Along with new Garmin Combo plotter / sounders (on the flybridge and internal helm) there is a new bow thruster installed for easy parking. Comments from the surveyor, "I have no recommendations, Zest has just undergone a two year restoration and looks like new". 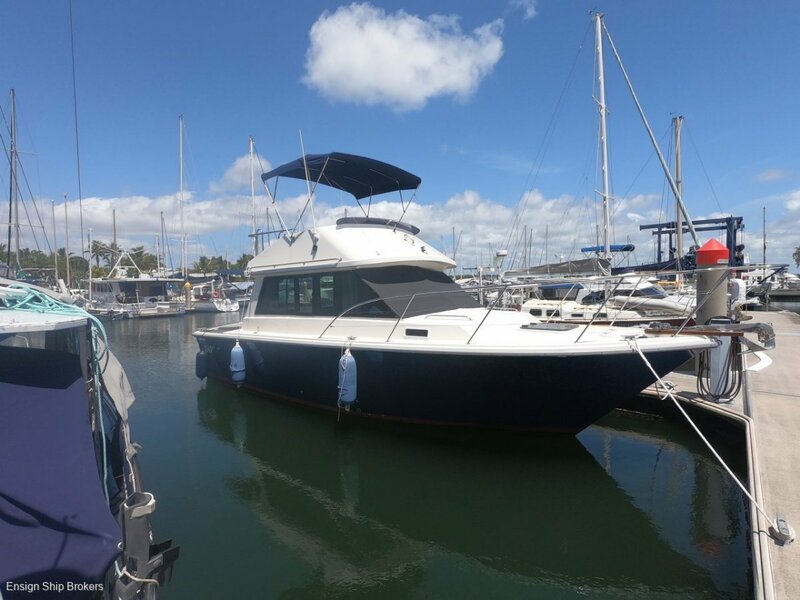 Contact Ensign Mooloolaba Marina to book an inspection – the boat is located in Tin Can Bay – access to the Great Sandy Straights and Fraser Island playgrounds. Galley: LAYOUT: Step down Open L Shape galley midships port side, Well equipped, functional new stove, Sink, hot and cold water. Cabins: Forward double V-Berth, Dinette converts to double, Sette converts to 2 singles.